We've released a new theme for project pages deployed on jboss.org domain. 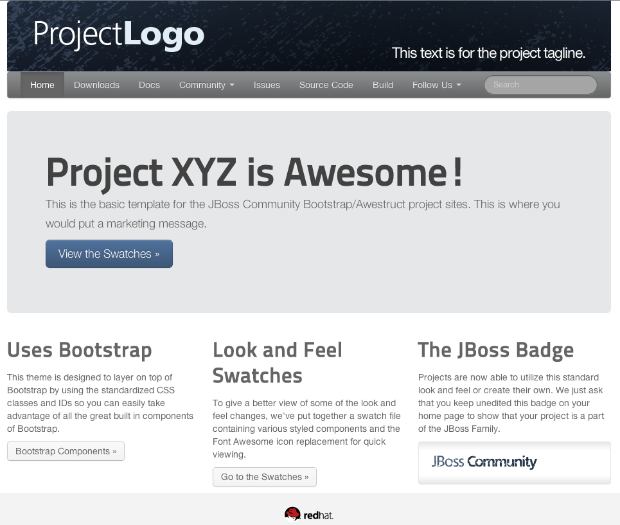 It's based on Bootstrap v.2.3.1 on top of which our JBoss Community theme is applied. To make the theme as easy to start with as possible, we've developed an Awestruct site project https://github.com/jbossorg/bootstrap-community which can be forked on github and used as a starting point for any jboss.org project site. Thanks to this project you gain all the needed configuration done together with layouts, custom Awestruct extensions and the theme itself applied. If you're interested to see how it looks live after it's built and deployed, click on the screenshot below. For more information on how to start with your jboss.org project site please refer to README.md file of the github project. The JBoss Community Team are proud to announce the upgrade of Magnolia CMS templates engine to the new Standard Templating Kit module. With this upgrade we introduce a much requested fluid design to the project pages which allows the content to be resized to 3 different layouts according to the width of the browser. This should make the content more readable on different screen resolutions and sizes. We also fixed CSS loading to prevent a Flash Of Unstyled Content (FOUC) issue.